The Congress Vice-president urged voters to ensure that the outcome of Bihar election is repeated, where BJP was trounced by a coalition. 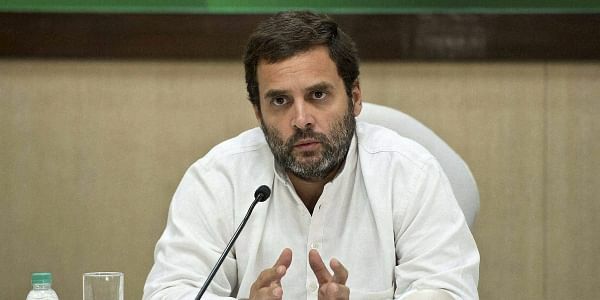 KANPUR: Hitting back at Prime Minister Narendra Modi over his 'SCAM' jibe, Rahul Gandhi today alleged that one who is in the wrong, sees scam in everything while ally and SP chief Akhilesh Yadav said the acronym stood for "save country from Amit Shah and Modi". Addressing a joint rally here with Uttar Pradesh Chief Minister Akhilesh, Rahul urged voters to ensure that the outcome of Bihar election is repeated, where BJP was trounced by a coalition led by Nitish Kumar. "Whenever Modi is nervous, he starts giving labels PPE, ABC, DEF, GHY. Now this SCAM.... A person, who is in the wrong, sees scam everywhere because this is his reality," he said, adding that the Congress-Samajwadi alliance in the state had made Modi jittery. "S in fact stands for 'service', C for 'courage', A for 'ability' and M for 'modesty'," he said at the rally in government inter-college ground here, giving his own coinage for the acronym. Attacking Modi over note ban, the Congress vice president said, "Demonetisation has hurt the poor most. Do not raise these slogans (denouncing Modi) but vote for Congress-SP alliance and ensure that Modi never utters the name of Uttar Pradesh again, like he forgot to say Bihar after the Assembly elections there". Rahul said that Modi is "afraid of the youths, who will give a befitting response to him in UP elections as he gave the slogan of Make in India, made promises, but provided no jobs". Akhilesh Yadav, who reached an hour ahead of Rahul, also took on the Prime Minister for his yesterday's SCAM taunt, where Modi had asked people of Uttar Pradesh to "rid the state of SCAM - S for Samajwadi (party), C for Congress, A for Akhilesh (Yadav) and M for Mayawati". Mayawati's party as it was BJP which had thrice formed the government with BSP and both of you have amiable ties." He alleged that the Modi government has given nothing to the people but false promises in its tenure while the Samajwadi Party had delivered in Uttar Pradesh. Hailing the Congress-SP tie-up, Akhilesh said, "A true friend is one who is big hearted. If you befriend a mean person, you will only suffer. We had an alliance with the Congress because both of us are large hearted. We are confident of forming a government in the state to complete the work left unfinished." The SP leader too raised the note ban issue, saying BJP should tell the country how much blackmoney has been unearthed. "No blackmoney has returned, but people have died while standing in queues outside banks and ATMs. We gave Rs two lakh to families of these victims but the Centre did nothing," he said. "BJP leaders betray the people, they will show you dreams and will try to mislead you but do not fall for it. For the last three years, BJP is only making promises and has done nothing for the people," he said. In contrast, his government has given Uttar Pradesh "metro, expressway, pension for the poor, laptops among other things", Akhilesh said. Rahul targeted the Prime Minister during most of his speech saying the people have realised the reality of the note ban. "Modi thinks that he is the only one in the country and the world who knows everything and speaks the truth while the people of India are foolish and ignorant. "One man cannot run this country. He cannot keep manufacturing falsehood," the Congress leader said and alleged that Modi has been working to benfit his "fifty friends" like Mallaya who have taken loans from banks. "Modiji is taking care of rich friends because during elections they give him money to spend," he alleged. He said the SP-Congress alliance government will work for youths, farmers, poor and the women. The BJP had stepped up its attack on the SP-Congress alliance in recent days with party chief Amit Shah saying yesterday that two "good-looking princes" involved in corruption are now out to mislead the people of Uttar Pradesh. "Both are 'khoobsurat shehzade' (beautiful princes) who are out to mislead the public. "Mother is fed up with one and father is fed up with the other. How will they help Uttar Pradesh? One has looted the country while the other has looted the state. Beware of them," Shah said in Mathura.